Posted: Sun Jul 12, 09 6:54 am Post subject: Utility breed ? What do you understand by the term 'utility' when its applied to a chicken and which traits would you expect it to have ? Surely anything bar a pet or show bird would be a utility chicken. Pass, bodger. Not being a poultry expert, I don't know what the official definition is. But for me, utility means 'practical', or 'useful'. That is, a bird which is inherently healthy, with no weird shapes or fashion deformaties getting in the way. One that is dual purpose I suppose. But I could want one with a slight accent on eggs, or there again, for table if thats what I want at the time. Nothing too extreem or unatural. Also I would want one that can hatch it's own eggs. I think that dual purpose could be one of the traits suggested by the term utility but there are other aspects to consider. For example, when leghorns first came to the country they were the top laying birds of their era and were kept by farmers commercially. When they went out of favour, presumably because some better layers came a long, their number dropped. The leghorn then fell into the hands of poultry fanciers who selected for looks rather than performance. Thanks to the fancier we still have them but not in the form that they were once in. Todays leghorns lay very few eggs when compared with their ancestors and anyone who can genuinely say that they have a strain of utility leghorns has a a fairly rare commodity. In other words, I think that the use of the word utility should be synonymous with the term practical. This is only one example of course and this scenario applies to many other once famous breeds of chickens. It must be noted that in the case of leghorns of either sort that they have never made good eating birds, nor did they ever lay enough eggs to compete in the laying stakes when compared with todays modern hybrids. IMO today they should however be on a par with the commercial leghorn strains of old. 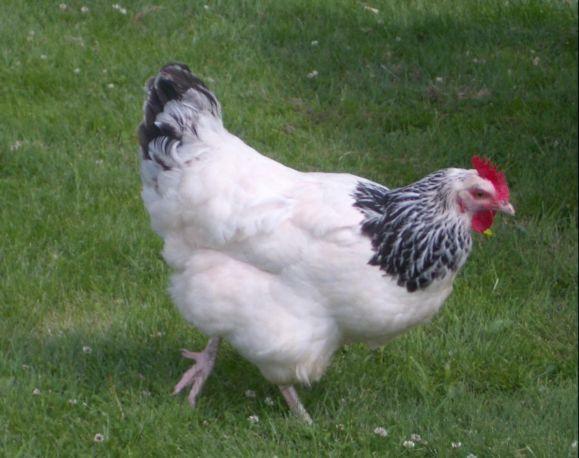 Fortunately, most claims by modern poultry keepers to having utility birds can be checked out fairly easily. Early poultry keepers were very good at keeping records and many egg laying trials were carried out and recorded for posterity. I was under the impression (but not sure where i got it from) that utility meant dual purpose. Thinking about it though makes me realise that the actual word utility just means useful - now there's a vague label for a chicken! Useful for what? Dual purpose suggests that the chickens are good for eggs and meat production. However, I had read that the Cambar is a 'utility' breed but when we culled some of our cockerels the meat smelled so 'gamey' that it totally put us off - so not much utility there for us! So if in future I hear a breed described as a 'utility', I will ask definately question what it means. Utility means selected for productive traits, whatever they may be. Of course health, fertility and longevity are all an important part of any utility breed. yeh I agree with Ixy - utility means it was bred for purpose - either egg laying or meat or both depending on bred, as oposed to bred for looking nice and winning show prizes. Lays a good number of eggs over many years (Commercial hybrids burn out after a year or two) & provides a good boiling fowl at the end of their life. As you said so many of the old utility breeds fell out of favour commercially when the brown hybrids came about & if it wasn't for the show breeders they might have disapeared altogether (for which we should be thankful). But it's a double edged sword because a lot of so called utility breeds don't lay anywhere near enough eggs to really be called 'utility'. Seriously useful info here for me Ixy! Great to see it laid out like this. Thx for posting! Actually TS, it was the white hybrids that first came on the scene. Its only the UKs egg eaters preference for brown eggs that brought about the brown hybrids. In the USA, the white egg layer is still king. These are two of my utility Light Sussex.